LoveSales brings the sales to you. Never miss a sale again with our Sale Alerts. 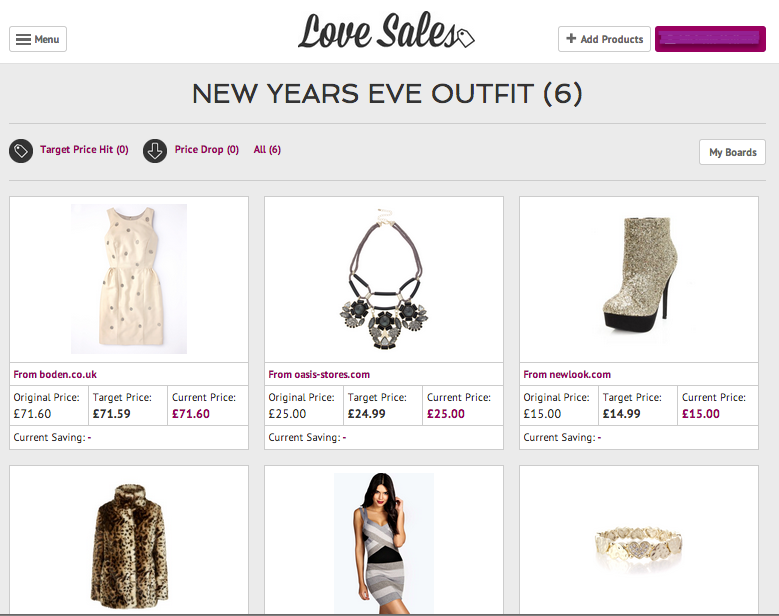 Add products from any site to your LoveSales Watchlist and we’ll alert you when they drop in price. Choose your favourite brands and we let you know the instant they go on sale. As a Christmas treat the person that adds the most products into their LoveSales List will win a £50 voucher to spend in the Boxing Day Sales. You also need to like LoveSales on Facebook or if entering by Twitter you will need to follow LoveSales and RT the competition. If there is more than one winner we will pick a winner at random. Winners announced tomorrow at 5:00pm. With the pending Boxing Day and New Years Sales, now is the time to start cramming your list with your favourite products. Most large brands will have a sale over the next few days, so it makes sense for you to add as many items you would like to buy in the sales now to your LoveSales list. So if the product drops in price you get alerted first. Yep, and all in the comfort of your own home – no crowds, no queues – heaven! 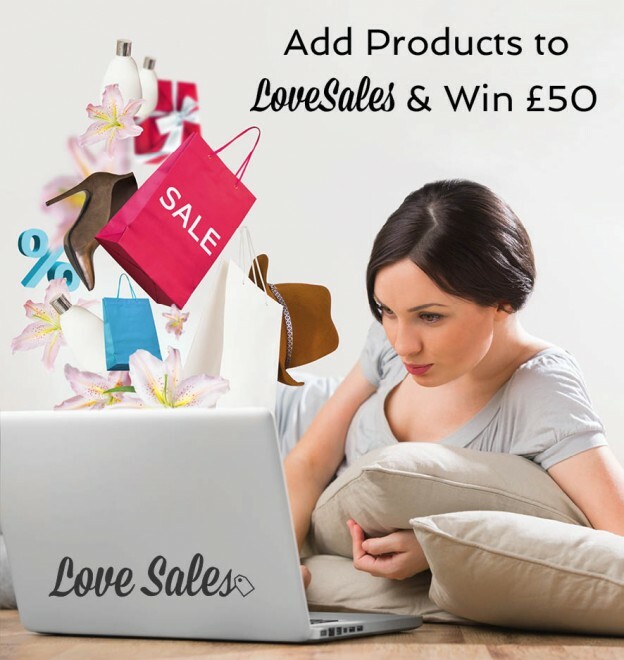 As it’s Christmas, we are in a very generous mood and will reward one lucky LoveSales user with a £50 voucher of their choice if they add more products than any other user to their list. If you are an existing LoveSales user, to enter, all you have to do is visit www.LoveSales.com, login and start adding more products into your lists. If you are new to LoveSales start shopping by logging in here www.LoveSales.com and add your products to your list. The competition is only based on the number of individual products added to your own personal list and not the number of general brands (like Asos, House of Fraser) you add. The promoter is: LoveSales.com whose registered office is at LoveSales.com, Spear House, Burntwood, Staffordshire, WS7 3GL, United Kingdom. Employees of LoveSales or anyone else connected in any way with LoveSales the competition or helping to set up the competition shall not be permitted to enter the competition. Only the products added between the start and end point of the competition will count. Closing date and time for entry will be the 24th December, 2014. 5:00pm. No further entries will be permitted after this date. Prize: £50 gift voucher of your choice. If we cannot for any reason purchase this giftcard we will source an alternative. LoveSales reserve the right to cancel or amend the competition and these terms and conditions. Any changes to the competition will be notified to entrants as soon as possible by the promoter. The competition is only based on the number of products added to your list and not the number of brands you add. Winners must be a UK resident and will be chosen at random by software provided by Lovesales.com from all entries received and verified by Promoter and or its agents. The winner will be notified by social media on 24h December. If the winner cannot be contacted or does not claim the prize within a further 7 days of the notification, we reserve the right to withdraw the prize from the winner and pick a replacement winner. If there is more than one winner, LoveSales will pick randomly via and automated system. This entry was posted in LoveSales News, Seasonal Sales on December 23, 2014 by Charlotte Williams.